CHINA has reportedly developed giant laser weapons that could cripple American satellites and blind the US fleet in the event of World War Three. Multiple Pentagon and intelligence reports warn about the potential of these weapons, and according to some sources, they are already here. Satellites provide communications, navigation, and intelligence to the American war machine, so knocking them out would seriously disrupt - and even render useless - much of its equipment. 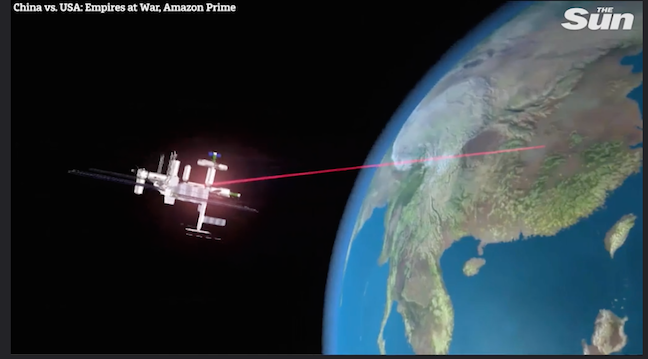 Amazon’s Prime’s “China vs USA: Empires at War” series says an existing weapons system could knock out American warships navigation systems and communications, leaving them practically useless. The series revealed: “The Chinese army has developed a system to blind the Americans. If the satellites are useless, the vessels will be left stranded at sea, and reliant on far more basic navigation techniques. A pentagon report, cited by Global News, seems to cement these fear. The Canadian news outlet said the US Department of Defense warned the development of anti-satellite laser weapons by China and Russia was one of the key drivers for Trump’s new Space Force. Both countries were developing energy weapons technologies to disable satellites, says the report, citing national intelligence director Dan Coats’ May 2017 worldwide threat assessment statement. However, the main threat that the report focused on was China’s ground-launched anti-satellite missiles. China has been working on laser weapons since the 1960s, according to a separate 2017 report. The International Assessment and Strategy Center suggested China could even have a space-based laser within a decade. The Express recently quoted a military strategist for the People’s Liberation Army, who claimed satellites and the US’s dependence on them was their biggest asset, but also their biggest weakness. Wan Xiangsui said: “The US relies on satellites to control their entire communications network and that is a weakness. “This dependence reminds me of the Greek legend Achilles who was invulnerable, except his heel. The Chinese have long been using lasers as a means of blinding their enemies. The Washington Post said high-grade lasers operated by the Chinese had injured two pilots in Djibouti.